Solipskier is an energetic endless game in which you draw the slopes that a skier races along. You need to build gradients and jumps into your run to make the skier pick up speed and avoid any hazardous obstacles – namely, orange zones where you’re not allowed to draw any terrain and red lines which kill you if you touch them. It’s easy to get the hang of the app, with helpful tips displayed at the end of each run to ensure that you don’t miss out on the nuances of the skiing mechanic. As you ski, hitting gates gives you a boost in both points and speed, whilst passing through gates whilst in the air gives you an extra batch of points. Passing through lots of gates consecutively makes you whiz along at eye-watering speeds, potentially giving your position on the leaderboards a leap but also increasing your chances of becoming fatally acquainted with a hazard. All of the action is accompanied by frenetic rock music, electric guitar roaring away wildly as a drum kit is given a beating. If you do well enough, the skier’s headphones fall off and the music gives way to the calmer sound of wind. The contrast between music and silence is supposed to give an increased sense of speed but it just made me feel more detached from the game. Thankfully, a ‘sticky headphones’ option allows you to keep the music pumping no matter how well you perform. Oddly, the sticky headphones option, together with music and sound volume controls, has been relegated to the iPhone settings menu rather than featuring in-game, so you have to exit the app if you want to change its settings. That’s not the only awkward interface choice: high scores and a mute option can only be accessed on the retry screen, and there’s no way to pause the game once you’ve started playing it. Sadly, there’s also no Game Center integration, although Openfeint is included. Still, it’s easy to get lost in the action and spend a long time playing the game. It’s not exactly packed with features – one mode, that’s it – but the quality of what’s present makes up for that. This also rings true with the graphics. 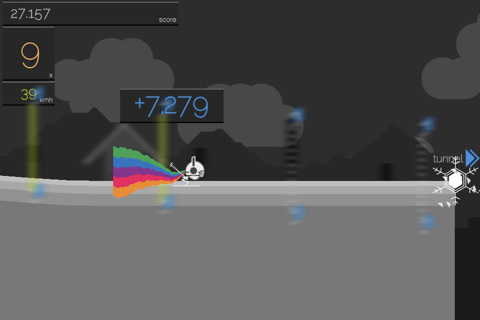 They might not vary much, but they’re so packed with polish that it hardly matters; the game is a mix of monochromatic scenery and flashes of rainbow colour that trail behind the skier when you’re performing well. Lovely. Solipskier, also available as a free flash game, normally costs $2.99 but is currently available for $0.99. The app store version is almost exactly the same as the flash version, so if you’re not sure about buying this app, I recommend that you try it out online first. For $0.99 it’s easy to recommend to anyone that likes simple games that have an easy flow about them, but for the normal $2.99, it might just be one for those that enjoy dedicating their time to battling against high scores. If that sounds like you, you should definitely give it a go.